Want to increase your Disney Wisdom? Get new Dis/dom blog posts sent to your email address as soon as they are available. Sure, everyone knows about the Crystal Palace, Tony’s Town Square and Be Our Guest, but have you ever eaten at Sleepy Hollow? If you have never been, please put it on your list of restaurants for your next visit. Sleepy Hollow – Where is it? As you walk down Main Street and enter the hub, there is an exit at about 10 o’clock that heads towards Liberty Square, the Hall of Presidents and eventually the Haunted Mansion. You cross the bridge, and it is immediately to your right. You can also go this way if you need to go around Cinderella’s Castle, that path leads right through the seating area of Sleepy Hollow. Many tables have fantastic views of the castle, but please note, there are very few tables that have any kind of coverage, so if it is raining, you are probably going to need to head elsewhere. So many good things. I get all Rumbly in My Tumbly just thinking about it. While Sleepy Hollow isn’t your normal Disney counter service restaurant, their menu is limited, the food they offer is unique and fantastic. Just so you are aware, some of the waffles are options with a snack credit from the Disney Dining plans, and the sandwiches are options with a counter service credit. Of course, the restaurant also has plenty of drink and dessert options, including a mean Ice Cream Cookie Sandwich. What Makes Sleepy Hollow so Good? There are a few things that make Sleepy Hollow fantastic. First, it is out of the way, and rarely crowded. Sometimes there gets to be a line in the afternoon when that funnel cake desires gets a bit to strong for some folks, but otherwise, it is manageable. Second, everything is made right in front of you. They cook your waffle right there while you wait, nothing comes from some central kitchen like you know the hamburgers at the other places do. This makes the line move a bit more slowly, but totally worth it. 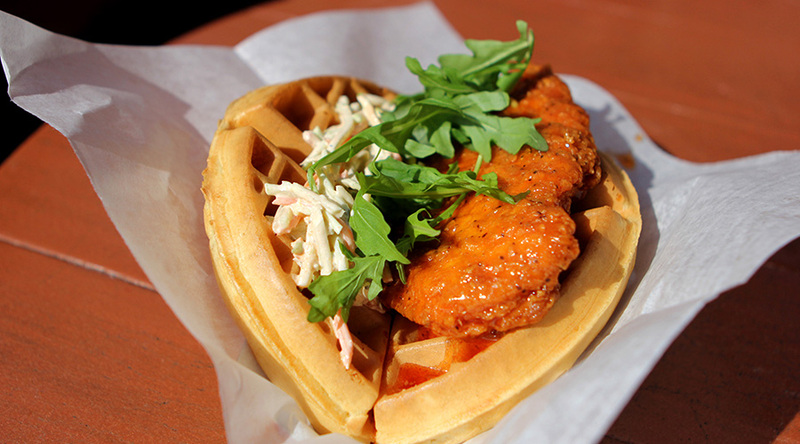 Third, where else can you get a waffle sandwich for lunch? Please note, because of fireworks and other events around the castle during the evening, Sleepy Hollow only serves their sandwiches until 5;30 pm. 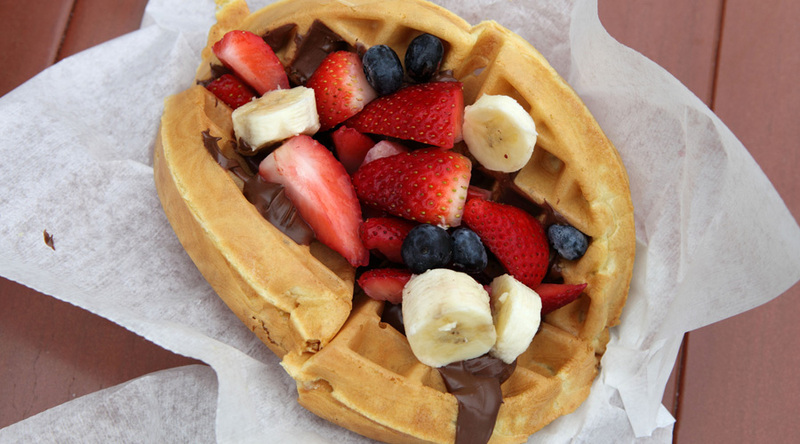 They are open after that and still serve a fantastic waffle with strawberries, but don’t plan on going to Sleepy Hollow for dinner, it is a lunch thing only. Did I give it away? 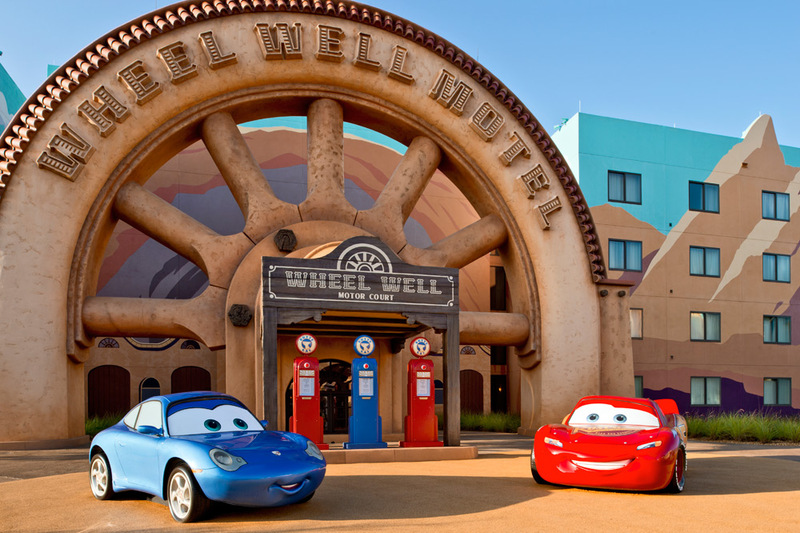 I have stayed at every single Walt Disney World Value Resort a few times, and my answer here is pretty easy: Disney’s Art of Animation Resort. In fact, the contest really isn’t even close. Opened during 2012, Disney’s Art of Animation is Disney World’s newest “resort” (technically, there have been a few Disney Vacation Club Resorts open since then). The resort was originally planned to be the second half of Pop Century, but only the main building and a few buildings were started before construction was halted due to a slow down at Disney. When the time came, Disney decided it needed a brand new resort, mostly because they finally figured out people would rather stay somewhere that is themed after their fantastic animated movies rather than giant rubik’s cubes and bowling alleys. Disney’s Art of Animation features 864 Little Mermaid themed “standard” rooms and 1,120 family suites, with either Lion King, Finding Nemo or Cars themes. 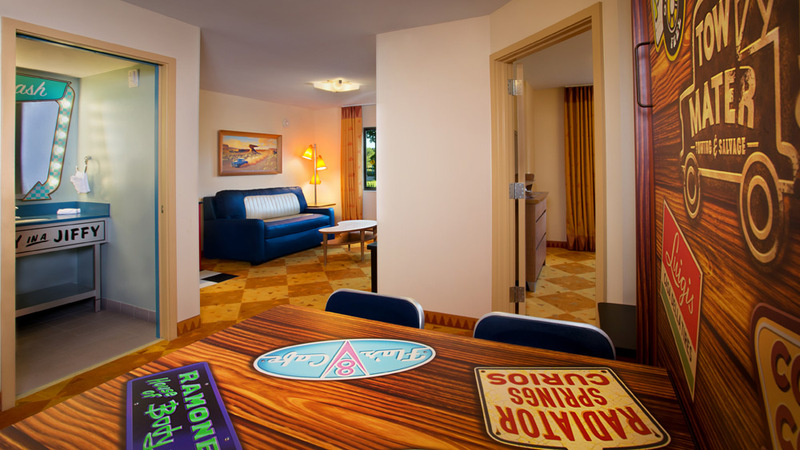 The standard rooms are identical in size and layout to the rooms at Pop Century, since these were completed in the existing buildings that were abandoned earlier. The family suites are brand new, and not really available anywhere on property. What about the other Value Resorts? I don’t really have a problem with the other value resorts, but they just aren’t as good as Art of Animation. The All-Star Sports, All-Star Movies and All-Star Music resort suffer from a few setbacks that are just too much for me to overcome. They tend to the be home base for any youth dance, cheer or sports teams staying at Disney. This severely skews the adult to child ratio, and leads to a less enjoyable experience. Also, these three resorts are built next to each other, and most times, the three resorts share one bus, so if you happen to be near the end of the line, there are times the bus will not even stop due to capacity. If your family really wants to stay at the resorts (especially Movies), you will have a blast. Pop Century was for quite a while my default value resort, and while there isn’t really any downsides there like at the All-Stars, Art of Animation is just much, much better. I am still very happy to stay at Pop Century, it just isn’t my first choice. What makes Art of Animation Special? Little Mermaid rooms – Who has a little girl that doesn’t love the Little Mermaid? 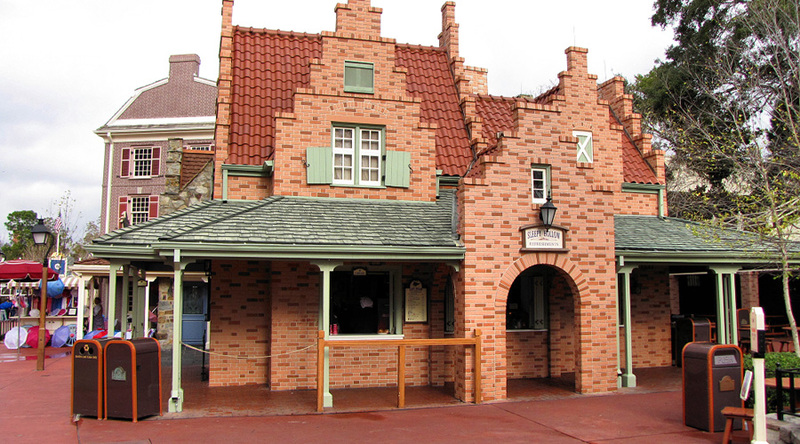 Think about it, these are the only rooms on Disney property themed after a Disney princess. All-Star Movies has sections themed after The Mighty Ducks and Herbie the Love Bug. How many kids even know who The Mighty Ducks are? The Little Mermaid rooms are super cute, and really well done. There is even a Little Mermaid themed pool for your little mermaids to enjoy. Family Suites – These family suites were probably the most requested room option at Walt Disney World for 20+ years. If you were on a budget, and had a family of 5+, you were extremely limited at Disney. There were the cabins at Fort Wilderness, but those don’t really suit some people. Some of the rooms at Port Orleans – Riverside could sleep 5 with the use of a trundle bed, or you could get 2 connecting rooms at a value resort. None of the options were optimal, but the family suites are fantastic. They feature a “master bedroom” with its own bathroom, a front room with a fold down table/bed combo as well as a pull out couch and another bathroom. These work great for a family with kids, and who doesn’t love Cars, Lion King or Finding Nemo? Landscapes of Flavor – This is Art of Animation’s food court, and it is head and shoulders above the other food courts in terms of offerings and food. You can find a pretty decent meal here. The Big Blue Pool – My favorite Value resort pool by far. Located in the Finding Nemo section of the resort, this pool is just beautiful, and surrounded by great Nemo decorations and oversized characters. 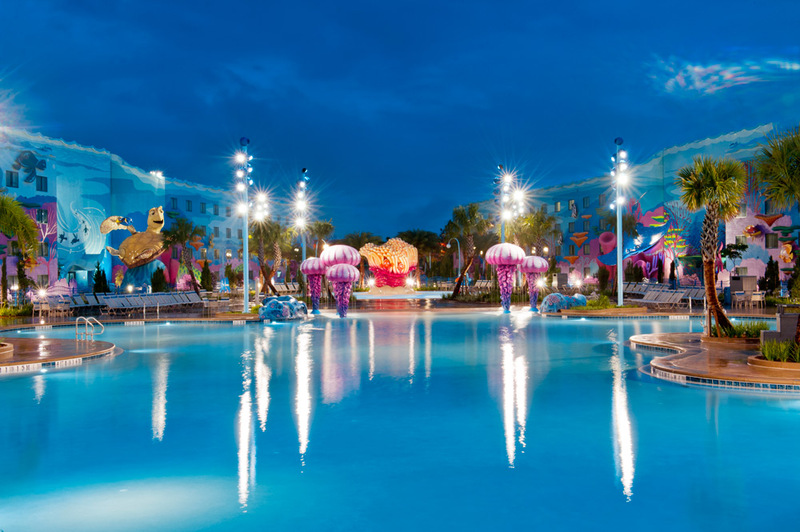 Did you know this pool is the largest pool at Disney World outside of the water parks? What are the downsides of Art of Animation? No discounts – Ever since the Little Mermaid rooms opened in 2012, they have been excluded from every single Disney discount that has been released. If you want to stay there, you are going to pay the full rate. Sometimes during the years, like over Christmas, that really doesn’t matter since nothing is discounted, but most of the year, you pay a decent premium to stay in these rooms. The Family suite are usually included in all discounts. Value resort – This is after all, still a value resort. So, you aren’t near a theme park, the pools don’t have slides or other amenities, there is just a food court, not a nicer restaurant, and the room quality isn’t as nice as the moderate or deluxe resorts. That said, I think I would rather stay in an Art of Animation family suite that most of the moderate resorts, if the price is close. 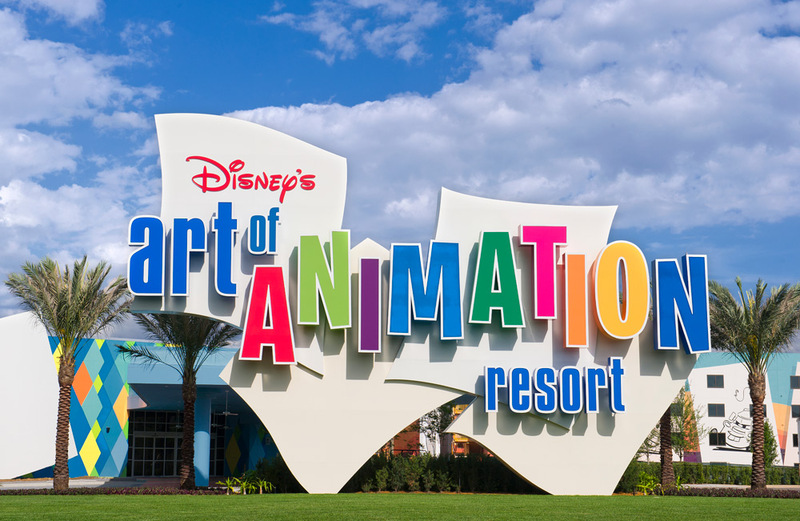 Have you stayed at Disney’s Art of Animation? When planning your Disney World vacation, there are some dates you will want to figure out well in advance, and keep track of them. Now, while some of these are not super important, some definitely are. While you may think it is crazy to plan a breakfast 6 months in advance, EVERYONE does it, and there are only so many seats at the table, so don’t dillydally. Your little princess may not be so princess like when she finds out you have to eat day old donuts for breakfast instead of eating with her favorite Disney characters. 499 Days – This is the furthest away you can book your resort reservation, assuming rates and packages have been released for your dates. There are times during the year when you may be inside 499 days, but you can’t book your vacation yet. 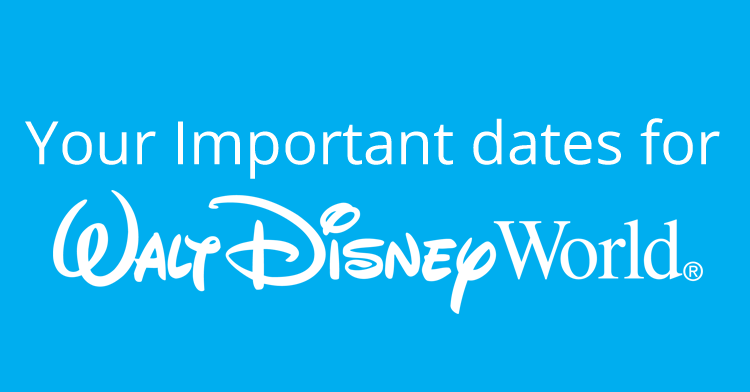 If you are just booking a Walt Disney World Resort room, then you can book them 499 days in advance. 365 Days – This is when you can rent a golf cart at Fort Wilderness. They sell out. 180 Days – Probably the most important date, this is when you can book your dining reservations. If you are staying in a Disney World Resort, you can book all of your reservations for your entire stay 180 days before you check in, if you are staying off-site, you can only book reservations 180 days from the day of the reservation. 180 days in advance is also typically when you can make reservations for specialty cruises, tee-times for the Disney golf courses, boat rentals, etc. 60 Days – Fast Pass Plus! You can now make your Fast Pass reservation online or on your mobile device with the use of the My Disney Experience app. Currently, you are allowed three Fast Passes per day that you can book in advance, and once those three are use, you can get another one at any fast pass kiosk in your park. Guests staying onsite, as long as you have a park pass linked to your My Disney Experience account, can make reservations for their entire stay 60 days in advance of check in. If you have an annual pass or just a normal Disney park pass, these reservations can be done 30 days in advance. 30 Days – At this point, if you have a Disney World package that includes your Disney Resort and park passes, your balance will be due for your trip. If you just have a room only reservation, your balance will be due at check-in. You should at this point also have your Magic Bands customized online as they will ship to you as soon as your balance is paid, and if you are taking advantage of the Magical Express airport transportation, that should be set up by now as well to give Disney time to get the necessary documents to you. 10 Days – By this point, you should have received your Magic Bands, Magical Express documents and Disney travel documents, and should be set to go.